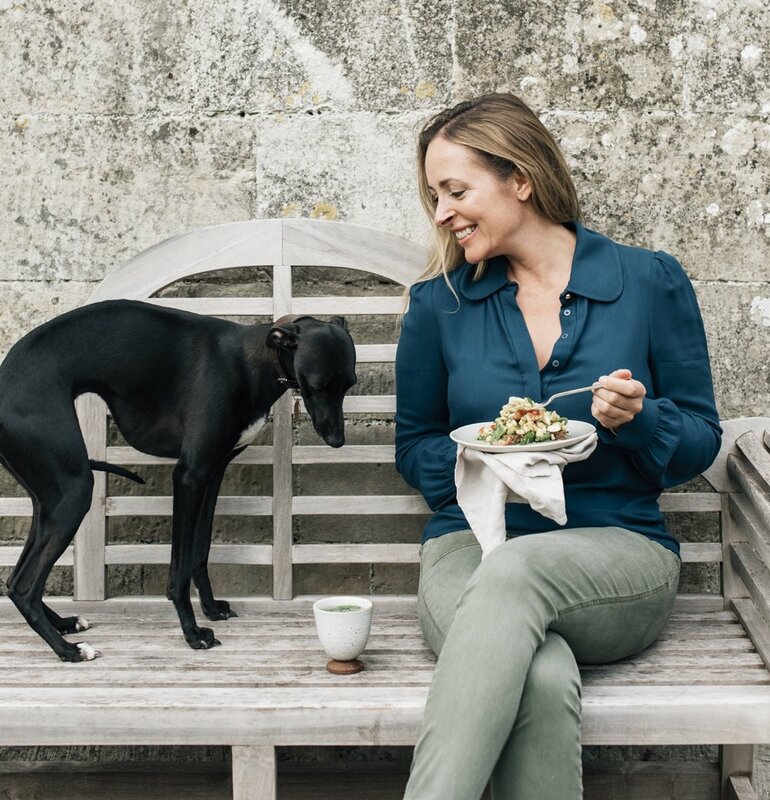 "My days are hugely varied, but often involve answering a long list of emails, creating new content for social media channels, cooking or recipe development and of course, spending lots of time with my baby daughter, Willow. I always try to fit some sort of movement into my day too – often it’s as simple as a quick walk with my dogs, and lately I have started to do a 20 minute yoga routine - it certainly makes me feel more energised when I do make the time to move. At the moment, the first thing I do every morning is have delicious baby cuddles with Willow. It’s heavenly! I used to start the day with our dogs jumping on the bed, then meditation then coffee. I’ll get back to that one day. I would say that my average breakfast is pretty healthy! But I absolutely adore a bacon sandwich, loaded with lettuce, avocado and tomato so I’ll enjoy that a couple of times a month. I wake up well by doing so slowly and gently. I always avoid an alarm clock where possible and let my wake up be natural (which means going to bed early). But of course now with Willow, it’s all quite different. I am trying to wake up 20 minutes before she usually wakes up so that I can get myself ready, but it all depends on what kind of night we have had. Some nights it felt like I never went to sleep! When I have some help with Willow, I’ll easily sleep for 11 hours. In summer, I’ll often be woken by sunrise at 4am. One thing I suggest to my very busy clients (in the morning) is to have a handful of quick breakfast recipes up your sleeve that can be prepared the night before and just whipped out of the fridge ready-to-go the next morning. Cold vegetable frittatas, overnight chia oats, good quality smoothies – there are so many great recipes out there that can make the morning rush no excuse to avoid a nutritious breakfast. The best place I’ve ever woken up is that first morning at home after coming back from the hospital, when I realised that Willow was finally here and lying right next to me. Complete and utter bliss. Gili Lankanfushi in the Maldives would be my second best. The best breakfast of my life was in Portofino in my early 20’s. The freshest, juiciest peaches, warm bread and pastries, coffee.. overlooking the sea. I’ll never forget it. I have already realised that finding this so-called balance is going to be a constant work in progress. Willow is only 5 months old, so she needs a lot of my time and attention at the moment. But as she grows and develops a little more independence, I am sure I will find more time to focus on my work. I have a great support network to help me along the way too. I am not trying to do it all myself. My biggest career highlight to date is probably seeing my first book, Eat Nourish Glow, translated into so many languages. The feedback I get from readers and clients all over the world makes the challenges of my job feel worthwhile. I'd spend a lazy morning with no plans curled up with the family at home in Wiltshire, newspapers and dogs on the bed, followed by a late lazy breakfast and then a potter into the woods with the dogs. My favourite Qnola breakfast? Almond & Vanilla – a great topping to some stewed berry compote and yoghurt."